Herebelow, you can find step-by-step instructions on how to download, install and use Azhagi+. However, if you are someone who prefers watching a youtube video to get things started and going, then you can watch any of the videos (with narration in Tamil, English, Hindi) listed at demos.html. In the page that opens, Click the link "Download AzhagiPlus-Setup.exe" to download AzhagiPlus-Setup.exe. Once you ensure that the download of AzhagiPlus-Setup.exe is fully completed, proceed to the next step. 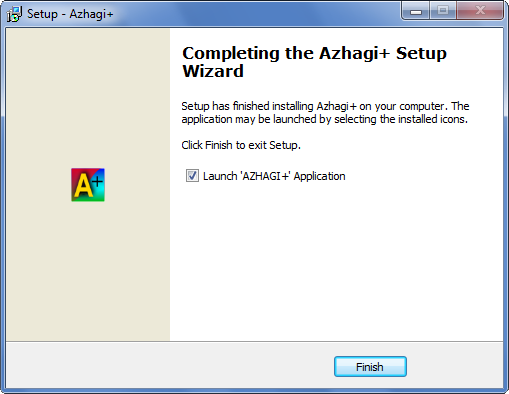 In case you are reinstalling Azhagi+, then check to see whether Azhagi+ is running. If so, close it and exit it completely. 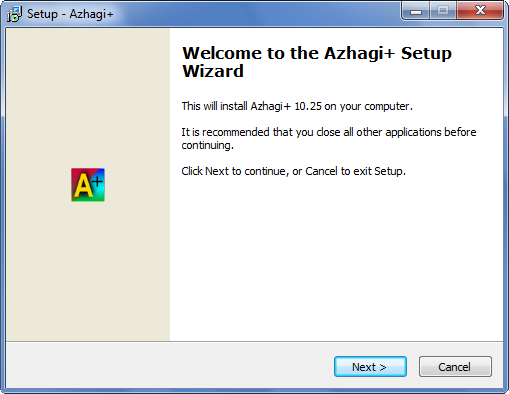 Click on the downloaded AzhagiPlus-Setup.exe to install Azhagi+ (AzhagiPlus) in your system. It is the usual kind of installation only wherein you have to keep clicking 'Next', 'Next', ... (Please see screenshots below for better understanding). After installing Azhagi+ as instructed above, an icon for Azhagi+ would have got created on your desktop (as shown above). Click on that Azhagi+ icon on your desktop to start Azhagi+. Now, Azhagi+'s starting screen will get displayed, as shown below. Now, don't click anywhere on this screen and also do not close it. Just keep it open and proceed ahead to the next step. If for some reasons^^, pressing Alt+3 (Ctrl+1, etc.) 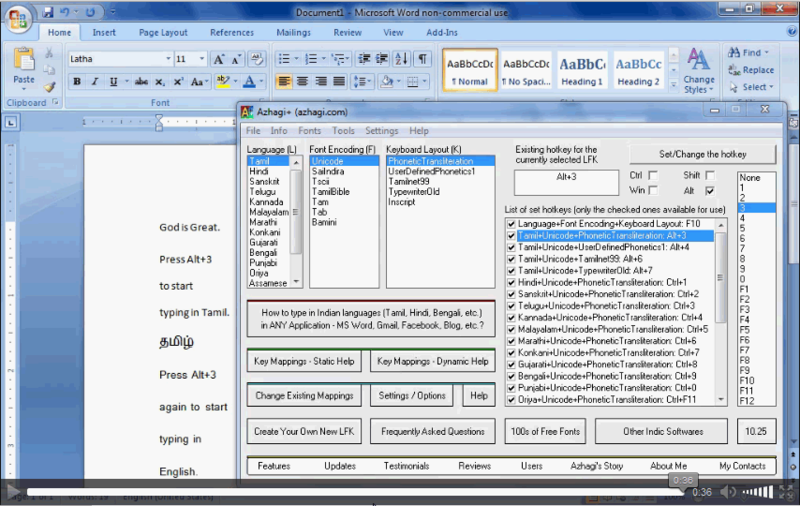 is not working at all, then use the 'global hotkey F10' to type in Indian languages. The 'English-to-Tamil Phonetic Key Mappings Table' can be seen here. The full list of "English to Indian languages" key mappings are in-built into Azhagi+ and also available online at multi.html. Recent additions/changes in mappings, if any, can be seen only in the online versions. Azhagi+ is not just a mere typing tool alone. It does more..... It is quite different. It has many unique and special features. How to use 'F10' as a 'Global Hotkey', How to change the 'Hotkey' (incl. making it 'None'), how to change the existing key mappings for any language yourself, how to create your own 'Language + Font + Keyboard Layout' combinations and type in them - all kinds of informations like these are present in oper-plus.html. In other words, oper-plus.html is the full operating manual of Azhagi+. If need arises, you can visit oper-plus.html#demos and see/read all the demos/tutorials therein. Apart from the above, if you still need any help or explanations, then kindly visit contacts.html page, follow the instructions therein and contact me, the author of Azhagi+. I shall definitely answer your queries. Can I auto-start Azhagi+ and keep it as an icon in system tray always? Yes of course. Please see oper-plus.html#settings as to how to effect it. Are there any video demos available? Yes, available. Please visit demos.html. How to type in PageMaker, PhotoShop, InDesign, CorelDraw, etc.? Please see the clear-cut video demos and the step-by-step instructions provided at pagemaker-photoshop.html and you can always type seamlessly in the aforesaid applications. Please see oper-plus.html#changehotkey to see the simple steps, with screenshots. There are no fonts present in the downloaded AzhagiPlus-Setup.zip. I want lot of fonts in different styles. Where to obtain them? Please visit freefonts.html. You can download 100s of FREE fonts of different styles in different encodings (Unicode, TAB, TAM, Tscii, etc.). unicodeff.html holds links to download free Unicode fonts for other languages. SaiIndira, TamilBible, Bamini, Unicode fonts, TAM fonts, TAB fonts, Tscii fonts - apart from these, I own lots of other fonts. Is it possible to transliterate in those fonts too? Yes, it IS possible. It is possible to transliterate in ALL Tamil fonts, without any exceptions. Absolutely. Please see anytamilfont.html for details. Using Azhagi+, it is possible to type in Non-Unicode fonts also, in any language as such. However, "by default", you can type in Non-Unicode fonts of 'Tamil' language only. Please see here for details.